Are You Living With Asbestos? Our passionate team have the experience and training to deliver a highly professional asbestos removal service throughout Fife, Edinburgh and East Scotland. DG Enviromental Asbestos Services are fully licenced to transfer and dispose of asbestos containing material in a responsible manner with absolute safety. Unsure about a material in your property? Our asbestos sampling service can offer you peace of mind, allowing you to make an informed decision with advice from our team. Looking for advice on strategy is best for you property? Then get in touch our experienced team for a site visit or simply have a chat. Asbestos can be found in any industrial or residential building built or refurbished before the year 2000. 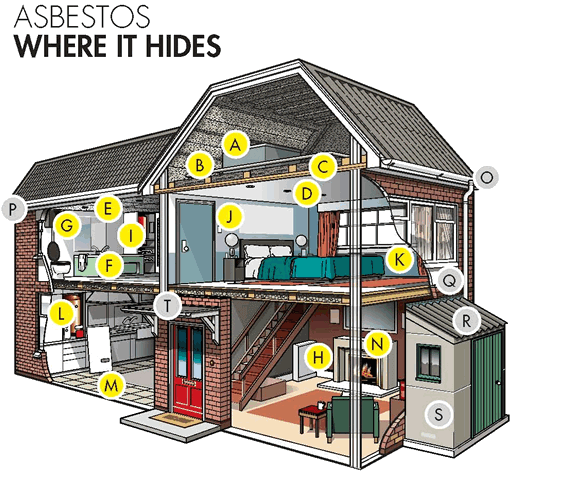 If you suspect asbestos in your property, don't put yourself or others at risk. We're a family run company based in Fife with years of experience and all the required qualifications that ensure we provide the most professional service. With years of expericence our small dedicated team believe that safety comes first so we carry out all our work in the most controlled conditions according to HSE guidelines. DG Environmental Asbestos Services operate through-out East and Central Scotland. We've removed Farm Shed roofs in Perth, Up lifted illegal dumping in Livingston, Lifted floor tiles in Fife, encapsulated pipes in Edinburgh and many many more services throughout Scotland. Our office is in Buckhaven, Fife so we're perfectly placed to quickly respond to calls throughout the East and central Scotland. We consider work from all over Scotland no matter how small, so please feel free to speak to the team with any enquiry. Our dedication to delivering a brilliant personal experience to each customer is one of the reasons we have customers reccommend us to friends and family. We offer a speedy service and can be available at times to suit our clients. So if you have a garage roof needing removed in Livingston or some Artex surveyed in Edinburgh we will do our very best to get to you as soon as we can. If you are concerned about possible asbestos materials in your property, we provide a professional, discreet and friendly service for survey work and removals. Dale and the team done a great job removing all the artex from my house before we moved in. They left the place spotless! Dale and the team came in and removed loads of asbestos sheets from our outhouse with such care and attention. Highly recommended! I phoned Dale in the morning and by the afternoon my asbestos floor tiles were removed. Thanks again.